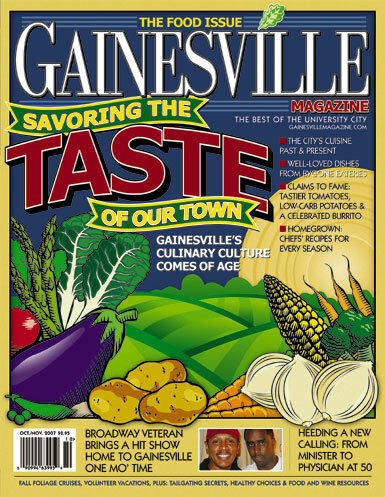 When I first arrived in town this past summer, my initial source for learning about local restaurants was by visiting the archives of the Gainesville Sun (particularly David Carlson's restaurant reviews) and GAINESVILLE Magazine. I also picked up tidbits of useful info on sites like Chowhound and Yelp. Th is post is a bit overdue, but the October/November issue - "The Food Issue" - of GAINESVILLE magazine is now available. As the title implies, this issue is full of interesting pieces about local restaurants, recipes and restaurateurs. The local food scene has certainly developed over the years. FloridaFoodHound is even quoted in the article, "Survival Amidst The Chains." The three independent local restaurants I recommend in the piece are Satchel's, Blue Highway and Newberry Backyard Bar-B-Q. Again, keep in mind I'm new in town and still feeling my way around. Anyway, even if I wasn't mentioned, this is an issue worth picking up - and keeping around!